Shimmering Moon (#8) figures to go off as a heavy favorite off the strength of her 17-length maiden score last time out. 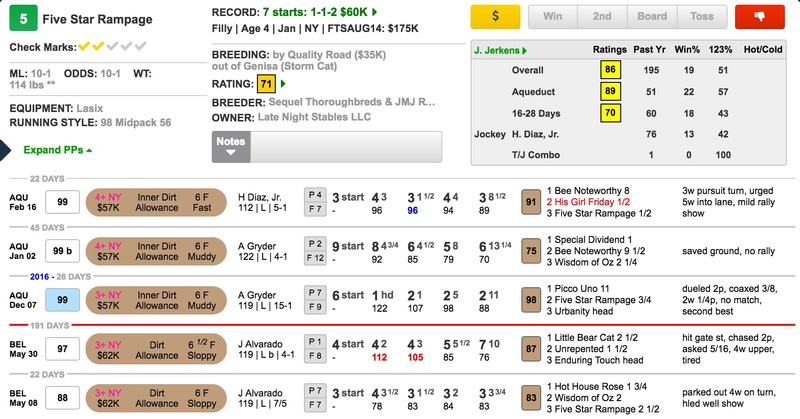 While she was beating a weak group that day, she ran yet another fast TimeformUS Speed Figure after earning strong numbers against tougher maiden fields in some of her prior starts. The TimeformUS Pace Projector is predicting that she will be racing on a clear lead early in a situation favoring the front-runner. She’ll be tough to beat, but I want to take a shot against her with FIVE STAR RAMPAGE (#5), who figures to offer better value. This Jimmy Jerkens-trained filly ran deceptively well last time. Racing three to four wide throughout over a racetrack that was tilted toward inside runners, she actually did well to stay on for third. She also ran quite well three back – in similar conditions to what she’ll face today – when holding on for second despite racing toward the inside on a day favoring outside paths. Her young apprentice rider, Hector Diaz, has been winning races in bunches lately and typically places his horses well. She should work out a great stalking trip if she’s good enough. I’ll key Five Star Rampage with Shimmering Moon in exotics, and use her with longer prices Sing for Beauty (#1), who could put some pressure on Shimmering Moon early, as well as the turn-backing Andesine (#7) and the in-form Palladian Bridge (#10).